The second planet away from the Sun is called Venus. It's ironic that Venus is named after the Roman goddess of love and beauty. Venus is one of the harshest planets in the Solar System. It's over 460 degrees Celsius. It has clouds of sulfuric acid in an atmosphere of carbon dioxide. Lava is found across the surface after being spewed from volcanoes. While a harsh place for you, scientists think it's an amazing planet. Everything we just told you is about all we know of Venus. The atmosphere is so thick on Venus that we've never even seen the surface. The most powerful telescope on Earth or in orbit can't see through the thick layer of clouds that surround the planet. The Magellan probe went to Venus in the early 1990's and sent back some interesting photos of the surface, but it had to use wavelengths of light that we can't see. The probe used ultra-violet and infrared light. This thick atmosphere also creates a greenhouse effect that helps raise the surface temperature of the planet. Do you remember the clouds of sulfuric acid? 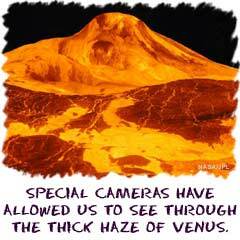 Those sulfur compounds in the atmosphere create Venus' yellow color. The atmospheric reflection also makes it a very bright object in our night sky. It is easier too see with a telescope than the dark planet Mercury. By watching the atmosphere of Venus, astronomers discovered that Venus is upside down when compared to Earth. It has a South Pole on the top of the planet and the North Pole on the bottom. Why? North and South Poles are defined by the direction a planet rotates. Since Mercury rotates in the opposite direction from Earth, its North Pole is actually on the bottom. The Venera, Pioneer, Mariner and Magellan probes have all flown by Venus. Their instruments determined that the surface is generally smooth. The combination of an active atmosphere and lava flows creates conditions that wipe away evidence of scrapes and scratches. The probes discovered some craters, but there are no mountains. This evidence allowed scientists to conclude that there is very little possibility of plate tectonics.